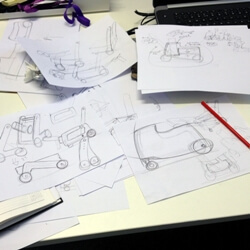 CIC have been developing a new product…shhhhh….don’t tell anyone just yet! We are in an exciting development phase of the new and improved Oxygem. This is a small oxygen cylinder and ventilator transportation device (Trolley!). You might have seen our Trunki Suitcase conversions, and even our own designed and build unit that was a real success for the few children who have used them, but now the idea is to redesign it having studied the old units in action. 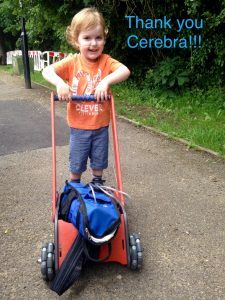 We have a few ideas that are being explored, and are trying to incorporate different ways of the child pushing or pulling it, but also for the child to sit on or in the and push along, or be pushed by an adult……not much to ask….but technically it is a very tough project! Below you can see one nice idea that we have been working on. It is similar in principle to a toddler’s Block Truck. 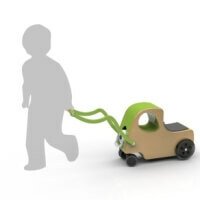 This unit is for small children and incorporates some great design features to help children walk un-aided. 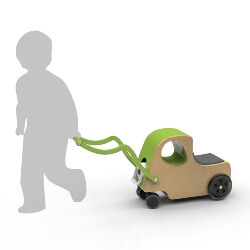 By holding the handle and pushing the child will be stable, and the rear wheels project further behind the truck so if they fall backwards the unit will not tip over. The really clever bit is that the wheel bearings only move forwards, and so when falling backwards the wheels act as a brake and will help prevent falling. This was first developed purely as a walking aid, but has been redesigned to accommodate oxygen, ventilators and food pumps. For older children and those with better stability we are still working on a more complex solution and below you can see some of the sketches ideas so far. What we are trying to achieve is one product with multiple uses. This will give children the most flexibility of use and make it more accessible to more families. To be able to take control of their own oxygen supply and get around unaided will give such a sense of freedom and independence that we are trying to make this a real game changing product. Once we are happy with the sketch ideas we will translate this onto the computer aided design program (Solidworks) and begin the lengthy process of prototyping and building test units. Once these are finished we can test them with our first few clients and refine the product. We look forward to being able to bring you more news in the New Year and will keep you up to date with developments. If you think any of these ideas might be able to benefit your child please get in touch via the website and let us know. The CIC team would like to take the opportunity to say a huge “Thank You and Merry Christmas” to all of our members, and people who have so kindly donated to enable us to do the most amazing jobs we could ever imagine working on! We look forward to working with you in 2015!! Cerebra’s Innovation Centre has started 2014 with great plans and lots of new projects in the making. Thanks to all of your great requests, we have lots of design work to do and have got stuck in already! 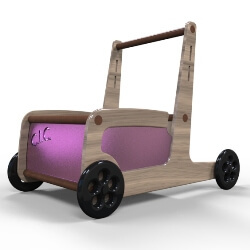 This is the design for the new oxygen trolley for young children, the CIC Oxi-Gem. We have designed it to include a fold-out handle, a seat for taking a rest and front wheel steering with lovely free running bearings to make easy work of pulling a 4kg oxygen cylinder. Don’t hesitate to contact us if you would like to register interest in this great product. This is just one of many products being adapted and designed by the Innovation Centre, funded entirely by donations. If you need anything from us please don’t hesitate to get in touch – head over to the CIC page on our website for more!